This landmark collection brings together a range of exciting new comparative work in the burgeoning field of hemispheric studies. Scholars working in the fields of Latin American studies, Asian American studies, American studies, American literature, African Diaspora studies, and comparative literature address the urgent question of how scholars might reframe disciplinary boundaries within the broad area of what is generally called American studies. The essays take as their starting points such questions as: What happens to American literary, political, historical, and cultural studies if we recognize the interdependency of nation-state developments throughout all the Americas? What happens if we recognize the nation as historically evolving and contingent rather than already formed? Finally, what happens if the “fixed” borders of a nation are recognized not only as historically produced political constructs but also as component parts of a deeper, more multilayered series of national and indigenous histories? 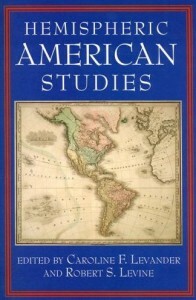 With essays that examine stamps, cartoons, novels, film, art, music, travel documents, and governmental publications, Hemispheric American Studies seeks to excavate the complex cultural history of texts and discourses across the ever-changing and stratified geopolitical and cultural fields that collectively comprise the American hemisphere. This collection promises to chart new directions in American literary and cultural studies.